Made in America | Stay and sit a spell. There are stories here. 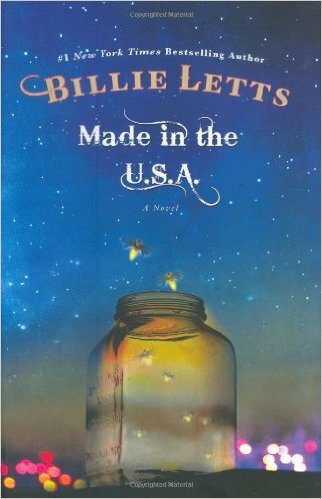 I just started reading Made in the U.S.A by Billie Letts. The first thing I noticed about this book was the jar of fireflies on the cover. Whoa, I thought–that’s like my short story collection cover. So of course, I picked the book up and was not at all surprised that it was Billie Letts. Although I had not heard of this book–and there is a version with a different cover, it put a smile on my face to see a similarity between her and me. You might know her from Where the Heart is, book and movie. I have always loved her writing and admired the way she could turn a seemingly simple story into something much deeper–something with heart that spoke about the average American person to the average American person. Not that her story premises are “average.” Have you ever given birth at a Wal-mart? But like the title of that novel (Where the Heart Is) implies, her stories are about the heart and lives of people that you just might encounter in the midst of your own life. I write those “simple” stories too and I like to read them. I think in the midst of this literary world of pyscho-thrillers and zombies taking over Elizabethan fiction that there are still people who want to read about people. People whose lives may appear simple on the surface, but just as we know how deep, complicated, magical, heartbreaking, triumphant and unexpected our real lives are, we know the pages and the people between the covers of books like Where the Heart Is and Made in the U.S.A. are not simple at all. We’ve lost Mrs. Letts, but her books remain. Here’s a lovely article from The New York Times that I urge you to read–esp writers of this type of fiction and anyone thinking they’ve come too late to writing or don’t have a “big enough” story to tell (Insecure Writer’s Support Group, Writers of the South , Women’s Fiction Writer’s Association, to tag a few) See how she came to writing late in her life and loved to write about “everday” people.